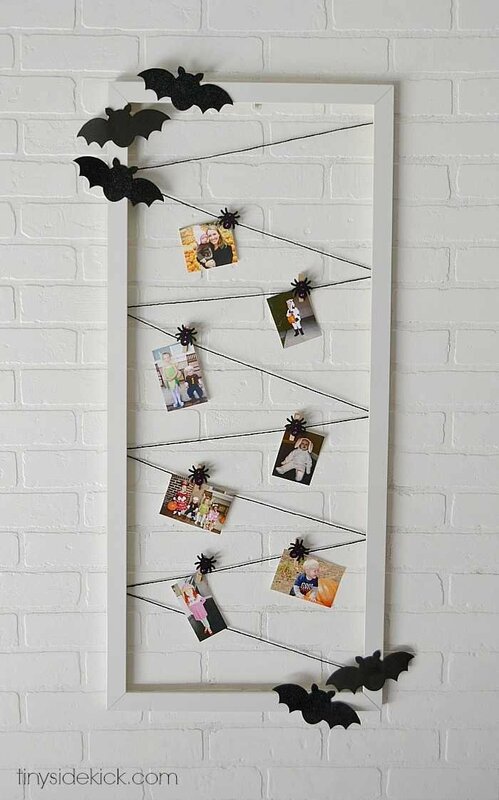 Inside: How to make an easy Halloween photo display so you can enjoy all your kid’s cuteness from year’s past! I’m pretty sure there’s nothing cuter than little kids in their Halloween costumes. Am I right? So Halloween comes and goes and we take a bunch of pictures and then pretty much never see them again. All that cuteness gone to waste. No bueno. 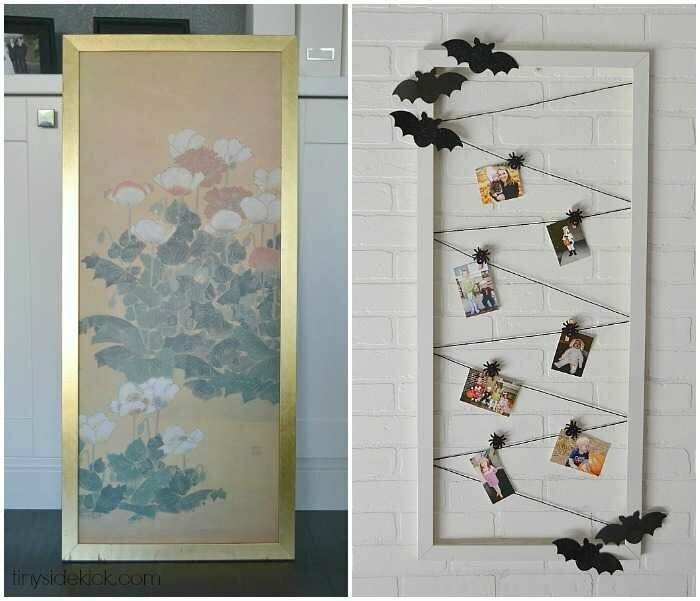 Well, this year I’m enjoying all the Halloween cuteness from year’s past with this super simple Halloween photo display and it was such an easy project! I kept costs low by using a thrifted frame that I picked up at the Goodwill. Some string or paper rope. The first thing you will want to do is get rid of the insides of the frame so that you have just the frame. If you spray paint it, be sure to give it a light sanding and a few light coats of spray paint and let it dry completely. 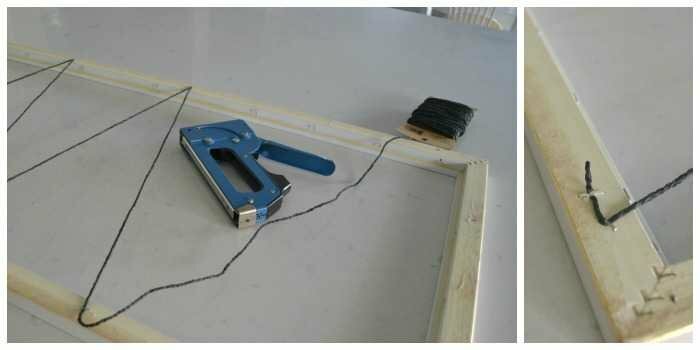 Next, you will attach the paper rope or string in what ever pattern you wish securing it with a staple gun on the back side of the frame. To start and stop the string use 2 staples and bend the extra rope or string down at a 90 degree angle and then staple again. This will keep the rope or string from slipping out. 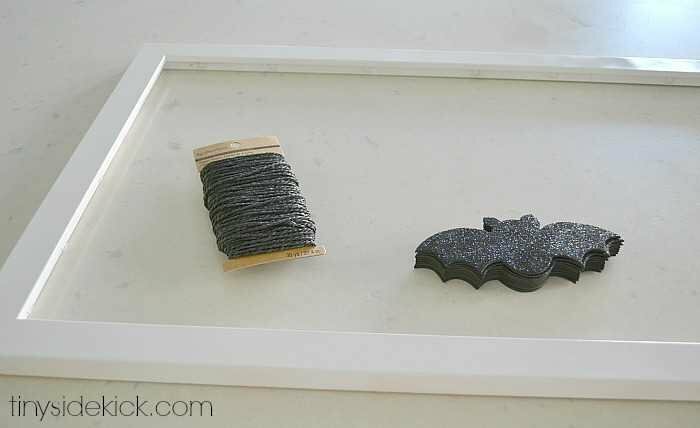 Once the string is attached, plug in your hot glue gun and arrange your cut outs how you want them on your frame. 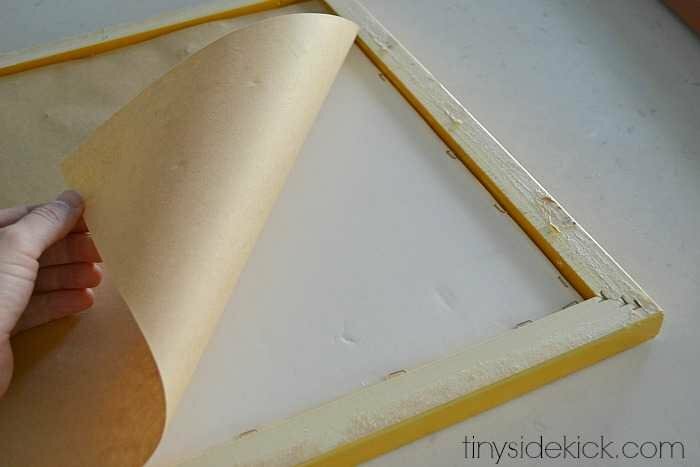 Once it is hot, attach the cut outs to the frame with a small amount of hot glue. 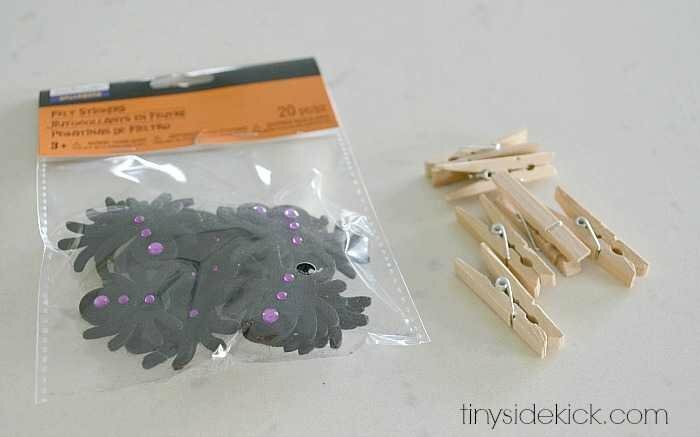 To add a little flare to my mini cloths pins, I attached some foam spiders to each cloths pin using the sticky dot already on the spiders. If you find some of these cute little things that don’t have a sticky dot, or if the sticky dot isn’t sticky enough you can use hot glue here too. In order to get my photos to be a bit smaller than the standard printing size I opened up a word doc and inserted images all over a page, then took my file to FedEx Kinko’s and had them printed on thicker paper with their super duper color printer. 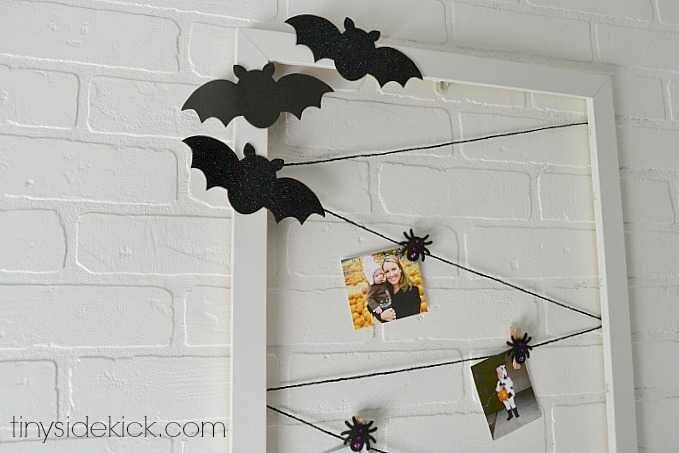 When I got home, I cut them out and clipped them to my new Halloween photo display! Now I get to enjoy the memories of past Halloween fun all month long and I have to say my little girl who is 5 1/2 (she would be so mad if I didn’t say the 1/2 part) loves looking at the pictures too. I’m sorta impressed with how much she remembers about each year and it is so much fun to reminisce with her. Such an adorable tradition!! Love it! I love that you have to say 5 1/2! Our 5 1/2 year old neighbor is very particular about being 5 1/2 too. 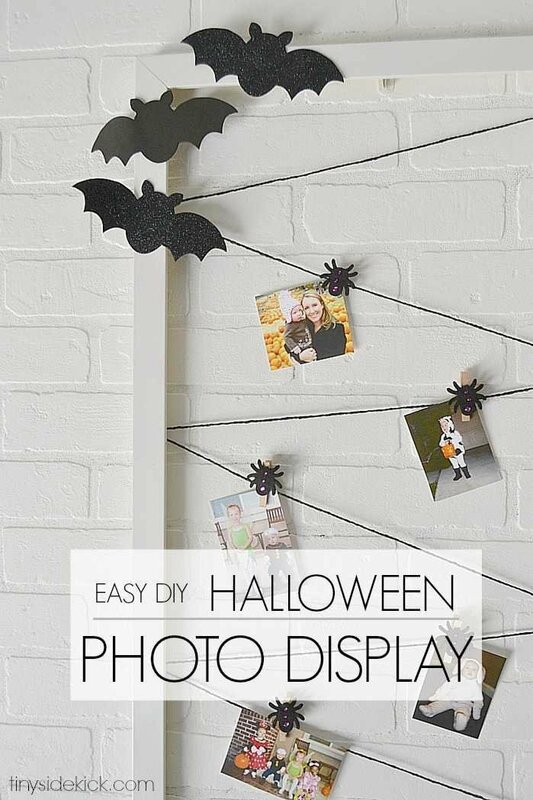 I also love the idea of displaying pictures of past halloween costumes! I need to get on it. I love this idea! 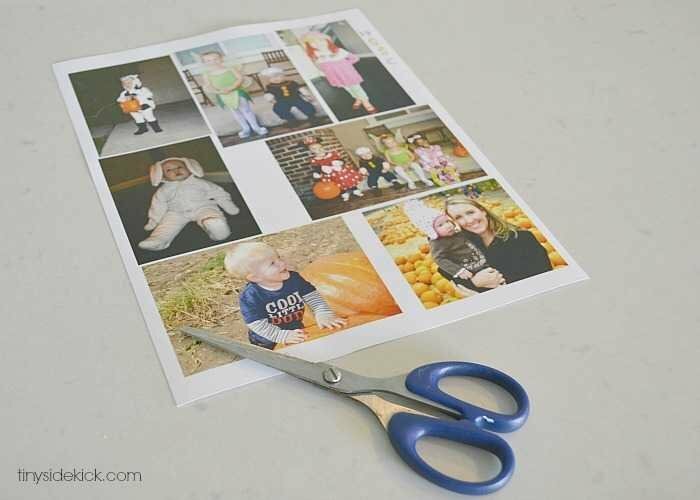 I maybe taking the next step and making one for Christmas with our past holiday photo cards. Thanks for the inspiration!